Brück, T., Ferguson, N.T.N., Stojetz, W., Izzi, V. Do jobs aid peace? The impact of employment interventions on peace, security and stability. GREAT Insights Magazine, Volume 6, Issue 1. February/March 2017. The idea that jobs build peace is the backdrop to many employment interventions, yet despite promising theories of change, weak systematic knowledge leaves the concept reliant on hope and assumption. 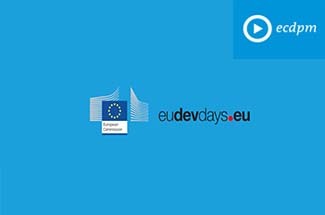 The notion that employment can contribute to peace and stability is the explicit backdrop to a large number of the labour, training and entrepreneurship programmes run by international organisations, and an implicit one in many more. The rationale behind this link is firmly grounded in strong and deeply considered economic theories, which are reviewed in a substantial new literature survey. 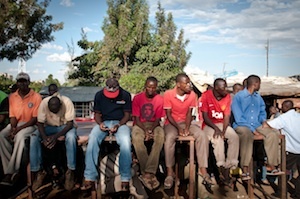 In this literature, two key concepts underpin the assumption that employment can build peace: first, that unemployment is one of the reasons why individuals select into antisocial behaviour; and second, that provision of employment, therefore, becomes a means of deterrent to such behaviour. Despite strong theories connecting jobs and peace, there remains a lack of systematic empirical knowledge on many of the key relationships that causally could link employment and stability. This includes the two key drivers of the link between employment and stability. Why individuals select into antisocial behaviour at all, let alone how these decisions can be deterred is, as yet, poorly understood. Moreover, even in situations where individuals are willing to engage in antisocial behaviour, it is not clear how such willingness can be organised into the collective violence that characterises conflicts, rebellions and uprisings. In these circumstances – particularly given the sheer volume of ‘employment for stability’ interventions by both number and expenditure – one might expect that, instead of robust empirical analyses, a significant body of programme knowledge has been developed. Although in some interpretations, this is indeed true, with programmatic staff displaying a wide array of knowledge and talents, there is a critical lack of meaningful evaluation of the concept. In an analysis of over 400 employment-for-peacebuilding programmes by international agencies, it appears that not a single one explicitly analyses the impact of the intervention on conflictual behaviour or peace-related outcomes. It is, therefore, not only the anticipated relationship between jobs and peace that remains theoretical but also that between employment interventions and peace. 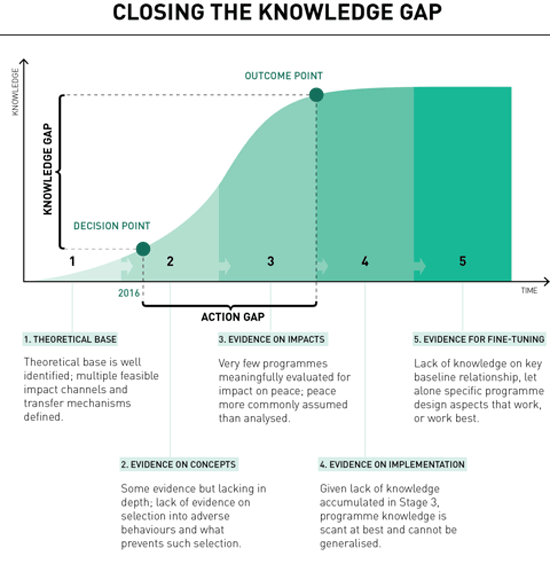 Despite these shortcomings, however, the strength of theory and conceptualisation implies that it is worth systematically closing these knowledge gaps. At the practical level, closing this gap requires support for the development of new research that looks at individual selection into antisocial behaviour and how such selection is organised into collective violence. At the programme level, it requires monitoring and evaluation for enhanced knowledge focussed specifically on isolating the impact of employment programmes on peace rather than simply assuming that it is an inevitable consequence of other programme outcomes. To do so, agencies must identify which programmes can have a peacebuilding impact (even when such an impact is not intentional) and understand the nature and probability of the effects that might occur. In this regard, employment-for-peace programmes must take place in fragile and conflict-affected scenarios (FCS); however, in such settings, it does not inherently follow that an employment programme need to intentionally have a peacebuilding focus to build peace. In turn, there is much to gain from analysing programmes that aim only to stimulate employment as well as those aimed directly at building peace through employment. The assumption that employment or vocational training programmes are likely to impact jobs, incomes and skills is entirely plausible, as is the assumption that peacebuilding programmes should reduce antisocial behaviour and increase stability. The cross-pollination of these two ideas, however, requires more thought, as the impact employment programmes can have on peace is, effectively, a two-stage process. Such theories require the juxtaposition of the understanding of why individuals might select into antisocial behaviour in the first place and, consequently, how employment interventions could deter them from doing so. In the first stage of this process, we identify three main mechanisms which subsume previously theorised drivers of antisocial behaviour at the individual level: a lack of contact across different well-defined groups; the existence of grievances between groups; and a lack of opportunity. These concepts are represented in Figure 2. In the second stage of this process, one must then consider how employment programmes can specifically encourage inter-group contact, reduce grievances between groups or stimulate opportunity. Contact works on the notion that in-group bias is an important concept in conflictual societies. Therefore, anything that aims to bring individuals from different groups together in a productive environment provides an opportunity to reduce or entirely overcome such biases. Employment programmes inherently provide incentives to come together in multi-ethnic (or other mixed) environments. As individuals are remunerated for placing themselves in such an environment – directly, through wages, or indirectly through skills accumulation – they directly benefit, which encourages further participation. Such encouragement is not necessarily present in other voluntary forms of engagement – such as in social situations – suggesting that employment programmes are uniquely placed to boost inter-group contact. Moreover, employment is likely to create mutual reliance and trust between groups, due to the interactions that are necessary for efficiency and task completion, potentially replacing negative interactions with positive ones. Particularly given the documented stresses and risks that may be associated with other efforts to bring groups together, such as reconciliation programmes, the work environment, where the focus is not on creating such interactions, may be a particularly useful tool in building contact. 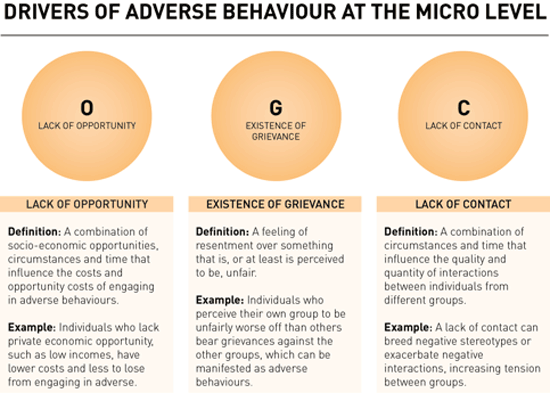 Grievance emphasises how perceptions of unfairness – real or imagined – between groups can create stresses that, in turn, can lead to manifestations of violence and conflict. These stresses can exist between any well-defined groups, ranging from individuals of different ethnicities to conflict between a government and (some of) the populace. Generating employment could be a key way to reducing these perceptions of unfairness – a programme that targets or includes a particular ethnic group, for example, may reduce grievances towards other groups; one that targets the poorest in a population may improve the relationship between those in that group and the government. Finally, opportunity builds on the idea that people with low opportunity costs from engaging in undesirable activities are more likely to do so. In the specific context of antisocial behaviour, this may imply that it is relatively easy or inexpensive for conflict entrepreneurs to incentivise individuals to take up arms; or that individuals themselves perceive there is little cost in doing so. Employment, or the income associated with it, are one way to increase these opportunity costs – someone with a regular income is likely to more reluctant to engage in antisocial behaviour because this individual faces greater costs from engaging in such actions. Alternatively, access to jobs or income streams may also improve an individual’s feelings of belonging to a society, or his or her perceptions and expectations for the future. In combination, this should have the effect of reducing individual propensity towards antisocial behaviour. 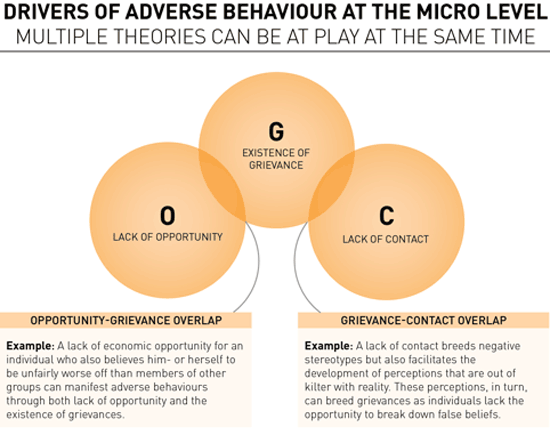 As shown in Figure 3, more than a single one of these mechanisms (contact, grievance, opportunity) can be in play in any given programme. Crosscutting these theories of change are two further important concepts: the ‘programme effect’ and the ‘employment effect’. 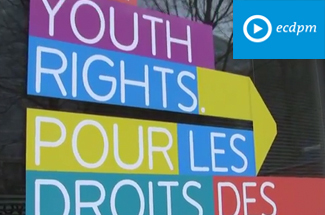 The programme effect implies that it is the programme itself – regardless of its employment impacts – that builds peace. The employment effect suggests that peacebuilding stems directly from the employment impacts of the programme. 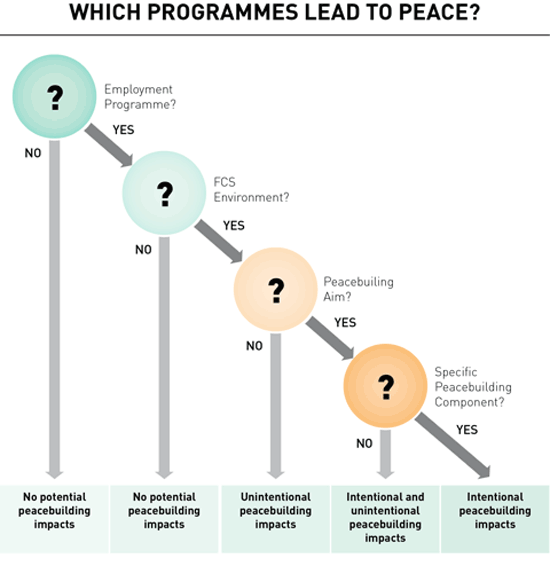 This jointly implies that peacebuilding impacts can be intentional or unintentional – there is, after all, nothing to stop the employment effect resulting from a programme that did not intend to build peace – and that an employment programme, ironically, may not need to stimulate employment to build employment. In general, these theories of change are well-developed, yet they often rely on the interpolation of findings from other areas – such as the dense literature on crime – into conflict settings. In turn, empirical support for the steps involved in each of these theories is often weak, inconsistent, or entirely lacking in the literature. In part, this stems from missing information in the first stage of the theoretical process outlined above; many of the mooted reasons for engaging in antisocial behaviour are hypothetical, and a lack of data – not least because individuals might not like admitting their own engagement in antisocial behaviour – hampers deeper analysis. It follows that is difficult to empirically confirm what deters antisocial behaviour when there is little systematic knowledge on what causes selection into it in the first place. What do the programme outcomes say about this relationship? ILO, PBSO, UNDP and the World Bank have implemented almost 2,500 employment-related programmes in FCS in the last decade, of which just under 450 were deemed suitable for analysis using a systematic review style methodology (see Figure 5). 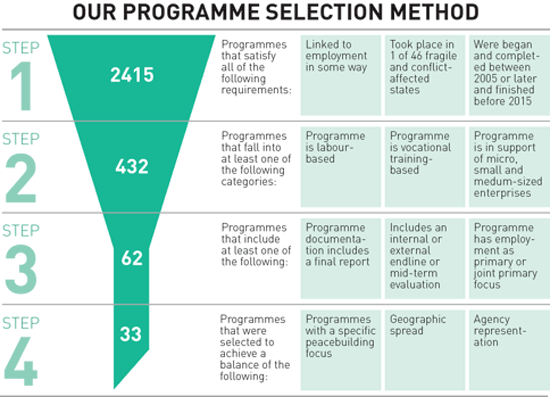 Of these 432 programmes, however, just over 1 in 10 have any kind of in-depth final report or evaluation. Particularly given that final reports are mandated by these agencies, this finding is of deep concern. Whether due to the fact that such reports do not exist at all, or are simply not available, the problem remains the same – the absence of final reports and evaluations is a significant barrier to the systematic accumulation of knowledge. Of 432 longlist programmes, only 51 have an evaluation of any quality at all and of these, few have been conducted with recourse to any kind of counter-factual, and none with the kinds of counter-factual that stand up to academic rigour. Even more damning is that not a single programme reviewed in the shortlist explicitly tested the cross-pollination hypothesis that employment programmes can build peace, which stands in contrast to the number that make substantive claims of having done so. The absence of systematic knowledge accumulation places questions marks over the veracity of the concept itself, let alone acting as a barrier to deeper understanding of what works, how it works, which programme features work best, and in which environments. When coupled with the academic findings in the field, which typically have shown mixed or insignificant findings, the knowledge gaps that stem from this are of particular concern, given the importance of the concept in funding and strategic decision-making. Despite the significant knowledge gaps, we remain agnostic on the impact that employment programmes can have on peace. Whilst there is little empirical evidence to support the notion, there is also little with which to condemn it. At the same time, given the importance of employment programmes in the peacebuilding strategies of international organisations, the absence of systematic knowledge on the relationship remains deeply concerning. In this regard, it is important to understand what is currently known and precisely where we stand on the knowledge spectrum. As shown in Figure 6, we stand significantly further back on the knowledge curve than the extent of programming might imply. At the same time, accepting this as a starting point is an important part of closing the gaps that remain. Figure 6 indicates an overview of what needs to be learned and, more importantly, facilitates development of the tools to create that learning. The knowledge gap in question, therefore, stems from an action gap. To close these gaps, two forms of action are needed. Firstly, organisations need to initiate, encourage and demand research that provides evidence on the key concepts that underpin the causal relationship between employment and stability; secondly, organisations then need to support and develop meaningful monitoring and evaluation (M&E) frameworks on employment for peacebuilding projects. This M&E should be conducted with recourse to meaningful counter-factuals and should focus directly on the peacebuilding outcomes of employment programmes, rather than assuming them as a consequence of a successful employment programme. In the meantime, given that present theories imply unintentional as well as intentional peacebuilding effects, agencies could well benefit from running and analysing programmes that focus only on stimulating employment in FCS. Suitably updating these programmes to meet the economic and market challenges in FCS should not only maximise their employment impacts but also provide the opportunity to study cross-pollination through both intentional and unintentional impacts. This article is based on the report Brück, Tilman, Neil T. N. Ferguson, Valeria Izzi & Wolfgang Stojetz (2016). “Jobs Aid Peace: A Review of the Theory and Practice of the Impact of Employment Programmes on Peace in Fragile and Conflict-affected Countries”. 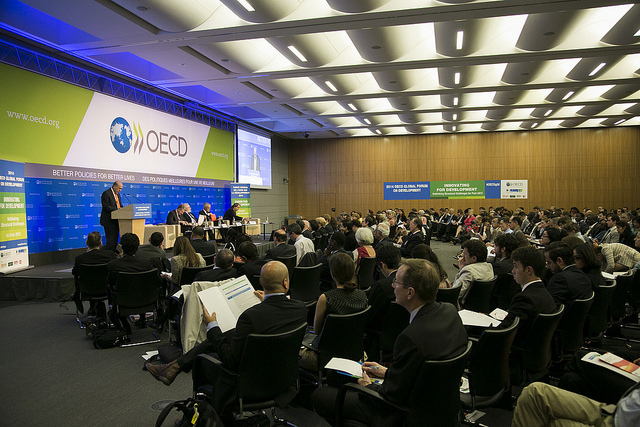 16 September, Report for ILO, PBSO, UNDP and WBG, Berlin. 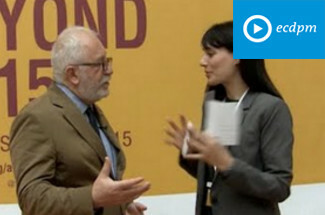 Prof. Tilman Brück is Director of the International Security and Development Center (ISDC), Berlin, and Co-Director of the Households in Conflict Network. Dr. Neil T. N. Ferguson is Research Affiliate at ISDC. Dr. Valeria Izzi is Honorary Fellow, Centre of African Studies, University of Edinburgh, and Dr. Wolfgang Stojetz is Research Affiliate at ISDC. This article was published in GREAT Insights Volume 6, Issue 1 (February/March 2017).